Stykkishólmur is located by Breiðafjörður bay on the north of Snæfellsnes peninsula (two hours from the capital, Reykjavík), and is surrounded with wonderful views of the bay‘s innumberable islands. The Snæfellsnes peninsula is a must visit when in Iceland. 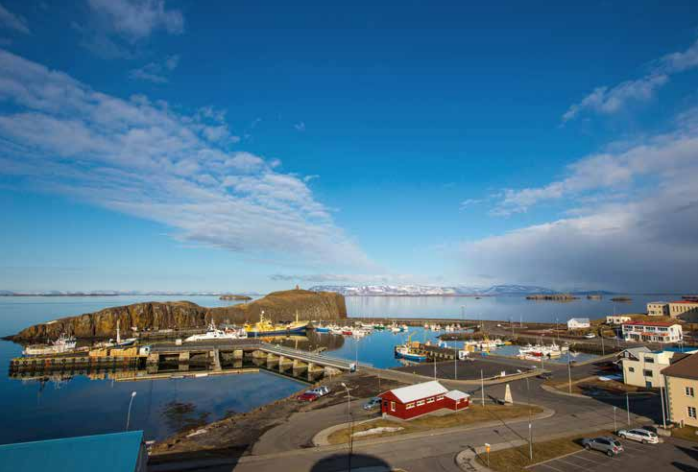 It is loaded with natural, historical and mystical phenomena and Sykkishólmur is the ideal base to explore it from. The town’s aforementioned proximity to Breiðafjörður bay contributes largely to its character, surrounding it with natural beauty. The town has a historical significance, as a former centre for trade and commerce and a seat of government. One of the landmarks in Stykkishólmur are the old houses in the centre, they create an atmosphere that brings you to a different time. In 2008 Stykkishólmur was presented with a planning award, partly for its renovation of the old houses. The inhabitants have systematically rehabilitated the houses, and they have gained new and exciting purposes — what was once a library is now an art installation, a fish packing house is now a restaurant, the old recreation center is now a volcano museum. In addition there are two other museums in town: The Library of Water, a permanent installation by artist Roni Horn, and the Norwegian House, the oldest two storey wooden house in Iceland which houses the Snæfellsnes district museum. In Stykkishólmur you’ll find quality restaurants, a supermarket, a golf course and an outstanding swimming pool, in which the water has received a quality certification from Institut Fresenius, two hot tubs with water straight from the earth and an excellent waterslide. 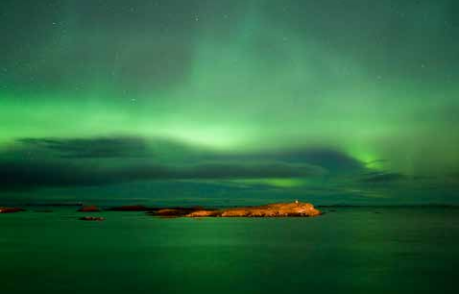 The guiding light in Stykkishólmur has been sustainability and environmental consciousness. In 2011 Stykkishólmur became a European Destination of Excellence (EDEN). The theme that year was tourism and regeneration of physical sites which fits Stykkishólmur to a T. Stykkishólmur and its inhabitants care about the environment a great deal and in 2008 Stykkishólmur was awarded an environmental certification, which it has had renewed every year since then. It was the first community in Iceland to receive such a certification. The recycling in Stykkishólmur has long been talked about in Iceland, because as in other things, Stykkishólmur was a groundbreaker in adopting a holistic recycling. The inhabitants have consciously made an effort to preserve the town’s old spirit, by retaining its appearance and maintaining old traditions from the bay area. Visitors have the chance to experience this when dining out in Stykkishólmur, where they’ll get fresh ingredients from the bay and surrounding area, turned into beautiful dishes by local chefs. Being environmentally conscious has led to a more beautiful and cleaner environment. Animals and nature reap the benefits which can be seen all around. 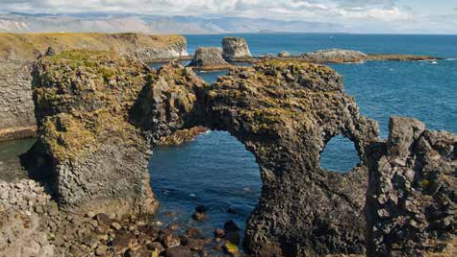 Snæfellsnes peninsula is sometimes referred to as „Iceland in a nutshell“. The views are grandiose, it´s the perfect place to take a walk, stay in the moment and enjoy all that Stykkishólmur has to offer.